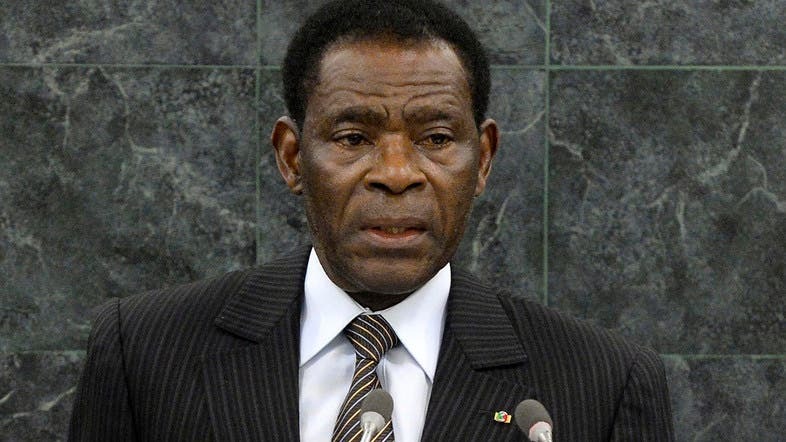 President Teodoro Obiang Nguema of Equatorial Guinea has warned of “serious and adequate information” that his small central African country faces a terrorist threat. “Central Africa faces a phenomenon it has never known, the phenomenon of terrorism,” Obiang said in a televised broadcast on Thursday night, without naming the key regional threat, Nigerian jihadist group Boko Haram, also active in neighboring Cameroon. Security forces have been deployed in impressive numbers over the past few days throughout the capital Malabo, which lies on an Atlantic island separate from the densely forested mainland. Both soldiers and police have been patrolling and carrying out checks on main roads and the major junctions in the city. “If the attackers come by sea... the navy, air force and army should be able to respond,” said Obiang, who has ruled the former Spanish colony since 1979 and presided over the development of substantial oil resources. At least 13,000 people are estimated to have died in Nigeria since the Boko Haram insurgency began in 2009, including civilians killed in military operations as well as at the hands of the armed fundamentalists. In February, Boko Haram launched attacks in Niger and Chad, extending the scope of raids and kidnappings beyond Nigeria and neighboring northeast Cameroon. Obiang on Thursday visited troops at a training center for the army and other security forces in Mosala, near Malabo. The television showed military exercises simulating clashes between government troops and a group of insurgents. “I came to encourage you to pursue your military exercises or manoeuvres, because there are some terrorist groups that destabilize (central African) states,” the iron-fisted ruler said.